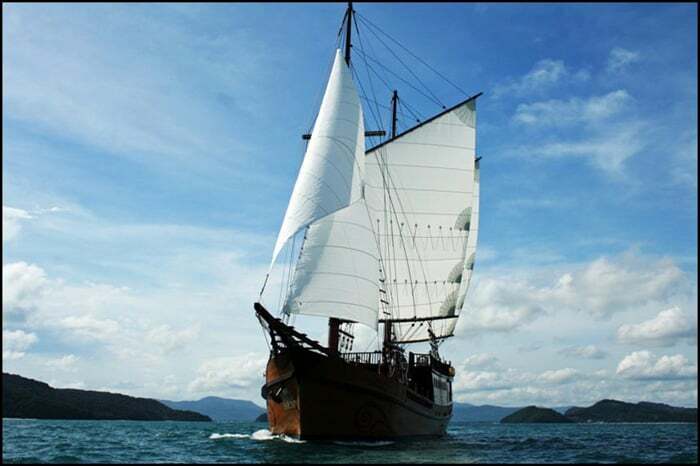 Dive in style on the 18th century schooner dive Liveaboard SY Diva Andaman. The 35m ship only loads fourteen divers, so you will have plenty of room to stretch your legs and relax in luxury between dives, including the opportunity to end your dive day with a Thai style massage. SY Diva will carry you to the best diving in the Similans islands, Richelieu Rock & Mergui Archipelago in Burma. The avarage price for diving with this liveaboard is 292$ per day. We have done the research for you and found everything you need to know about Diva Andaman - we found the best prices and we've collected reviews from other divers. The S/Y Diva Andaman is one of a kind liveaboard. It has a size of 35-m and a 7-m beam. The one of a kind classic looking yacht adds a touch of the early 20th century to your expedition. It can welcome up to 14 guests per cruise. Guests can choose from seven luxurious, spacious cabins. These cabins have fully furnished Double bed cabins and two twin bunk bed cabins. Each room has individual air-conditioning, en suite bathrooms and toilets with hot water, a fridge, a desk, sound system, cupboard/drawer storage for clothes and a flat screen TV. Guests can also enjoy reading about marine life in the small library and view the magnificent fine arts at the open gallery. Visit the saloon with an audio and visual entertainment system complete with newly released movies. Guests can relax on the cushioned lounge chairs on the shaded sun deck they can enjoy the traditional Thai massages for relaxation. These amenities will make your six night stay well worth it. Each cruise has an exceptional Thai dining service, buffet style and a la carte meals with a fusion of flavors from the Andaman Sea. Enjoy the continental spread with fruits, homemade granola, croissants and fresh herbs from the onboard hanging garden. Buffet-style meals served for lunch, and Diva Andaman’s signature dishes with three-course meals cooked with perfection served under the stars. Snacks are available, as well as a selection of cocktails, beer and wine from the specially designed wine cellar to maintain the correct temperature. Located on the back of the main deck is the dive deck. It is spacious and well equipped with personal gear boxes, a camera table, and rinsing tools for washing the dive equipment and cameras. Wetsuit hanging, fin storage, and deck rinse showers are available too. Dive rental equipment is free of charge. Nitrox and dive courses are available for a fee. The professional Diva Andaman crew will guide you through your dive expeditions. Dive groups with four guests per 1 dive are recommended to ensure that divers won’t miss any exciting parts of their dive. Night dives are available for the guests, and they will have a total of 18 dives during their cruise. Hotel pick up is arranged for the guests at around 16:00 and can check in on the boat as of 16:00. Diva Andaman departs Khao Lak Tamplamu Pier at 18:00 on the same day. Cash is the accepted payment on board if ever you need an extra service. During the trip, guests can explore the Similan Islands on the West Coast of Southern Thailand. It consists of eleven islands; Koh Bangu, Koh Bon, Koh Ha, Koh Hin Pousar, Koh Meang, Koh Mayan, Koh Payang, Koh Payu, Koh Similan and Koh Tachi. These islands are a perfect destination for tourists’ divers and explorers because of its remote location the marine life. Take a tour to Richelieu Rock, an underwater rock formation that holds small sea creatures and giant whale sharks. The Mergui Archipelago is an off-grid area where no Wi-fi is available and is perfect for snorkeling as well as seashore activities.